Stained or Yellow Teeth? We Can Help! Teeth stains are all but inevitable. Whether caused by the aging process, wine, food or smoking, most people experience tooth discoloration at some point. 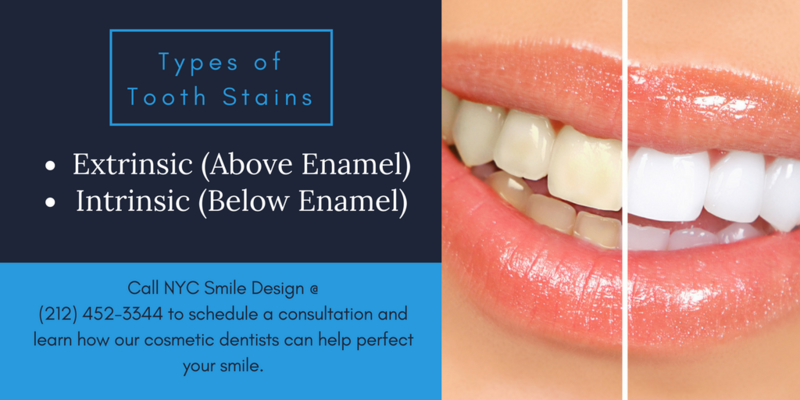 Fortunately, you can take simple steps to prevent stains and you can erase them with professional teeth whitening at NYC Smile Design. Professional tooth whitening is the most commonly performed cosmetic dentistry procedure in the country, and for very good reasons: it is much more effective, safer, more comfortable, and less aggravating than whitening with a store-bought kit. If your teeth are stained and you feel uncomfortable with their appearance, Dr. Elisa Mello or Dr. Ramin Tabib would be happy to discuss your teeth whitening options during your next visit to our Manhattan cosmetic dentistry office. To schedule a tooth whitening consultation at NYC Smile Design, please call 212-452-3344. We welcome teeth whitening patients living in New York City and all surrounding areas. Extrinsic stains are caused by lifestyle choices such as tobacco use, frequent consumption of dark-colored foods and beverages, sodas and sports drinks, inadequate brushing, and infrequent dental visits. Under many circumstances, surface stains can be lightened, at least to an extent, through a professional cleaning. Topical Tooth Whitening Addresses Extrinsic Staining. Maintaining a strong daily oral hygiene routine can help remove surface tooth staining before it sets. However, habits like daily coffee or soda consumption and using tobacco may render any at-home efforts ineffective. If you smoke, we cannot stress enough the importance of quitting – not just for the appearance of your teeth, but for the health of your mouth. Smokers are at a significantly higher risk for gum disease and oral cancer. Tobacco users are also at higher risk for tooth decay, chronic dry mouth, and relentless halitosis. Intrinsic stains may be a result of the aging process. They may also be caused by external factors such as excessive fluoride in water (fluorosis), tetracycline and doxycycline, and mouthwashes containing chlorhexidine and cetylpyridinium chloride. Because they are located below the enamel of the teeth, these stains may not respond to topical bleaching. 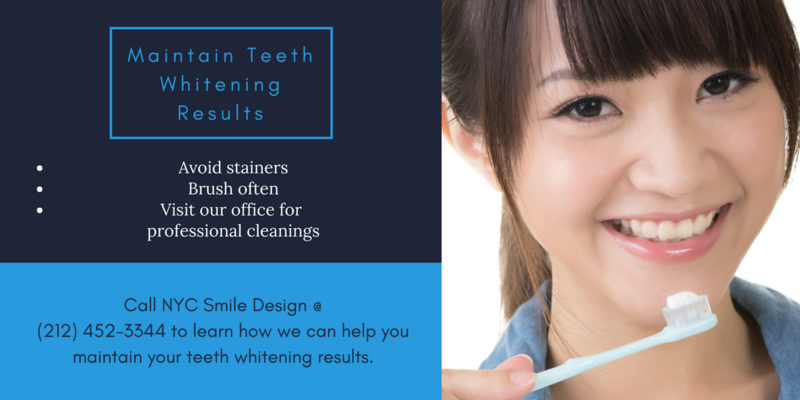 Deep stains – those that occur beneath the enamel of the teeth – can still be treated and may even respond well to the in-office teeth whitening services offered at our Manhattan location. 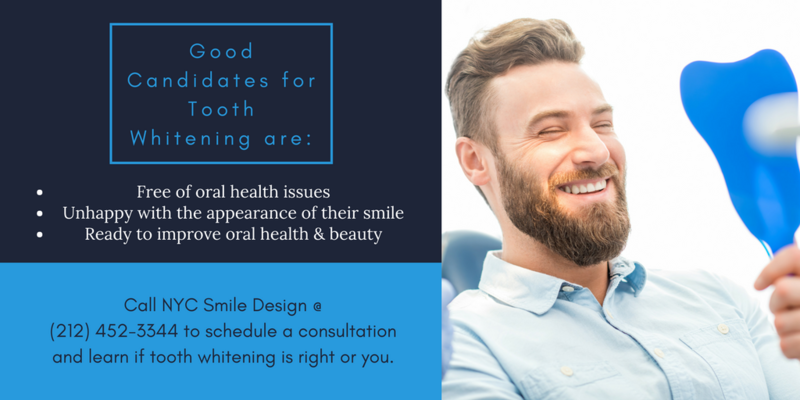 However, if staining is significant or unlikely to respond to tooth whitening treatments, we will discuss other cosmetic dentistry options that may work better for your needs. The best way to learn if tooth whitening or another service will most enhance your smile is through a one-on-one consultation with Dr. Tabib or Dr. Mello. Call us to set up your consultation today. Zoom! Laser Teeth Whitening - Zoom! is the safe and effective laser whitening treatment that our cosmetic dentists use for in-office teeth whitening. With Zoom!, we can lighten your teeth several shades over the course of just one office visit. In fact, in-office tooth whitening can often lighten teeth up to ten shades in one hour. During your in-office teeth whitening, bleaching solution is applied to the teeth with the assistance of specially designed trays. Once the trays are in place, a laser is used to gently heat the solution, working to activate oxygen molecules that can penetrate enamel to remove stains. Unlike in-office teeth whitening without laser assistance, our process allows the bleaching solution to dissolve some extrinsic stains and may be effective even in cases of more pronounced discoloration. For good candidates, Zoom! laser teeth whitening offers immediate results. It may also help reduce risks of sensitivity and gum irritation, both of which can result from over-exposure to topical bleaches. Customized Take-Home Kits - For patients who prefer to whiten their teeth in the comfort and privacy of their own homes, we offer customized take-home whitening kits. These kits come with customized application trays that hug the natural contours and grooves of your teeth, enabling consistent and complete whitening of the enamel. Unlike store bought kits, our teeth whitening trays are molded from models of your actual teeth, a benefit that also reduces risks of tooth sensitivity and gum irritation. 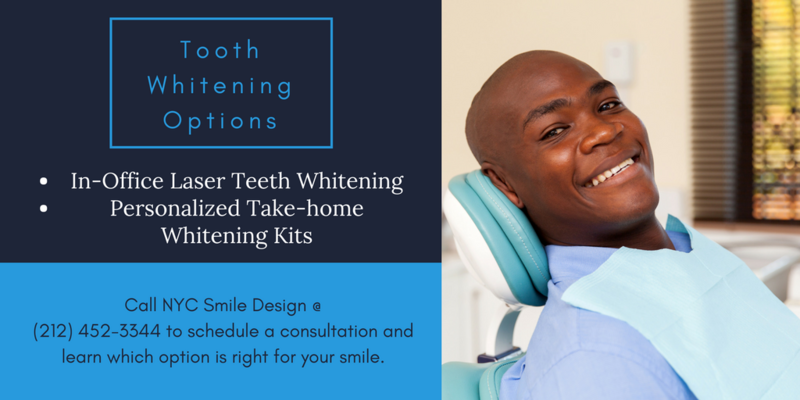 Take-home kits gradually lighten enamel over the course of three to four weeks. Worn daily during this time, these kits can lighten teeth several shades and are a wonderful option for men and women who would prefer teeth whitening at home. While this option is wonderful as a stand-alone for some patients, we also offer custom take-home whitening kits with each Zoom! treatment. This way, you can touch up your Zoom! results as time goes by. Contact NYC Smile Design to Learn if Tooth Whitening is Right for You! Both of the teeth whitening options provided by our New York City cosmetic dentists are designed to be long-lasting. How you care for your teeth after treatment will, however, have a more direct role in the amount of time your results are visible than anything our dentists can do. In addition to these steps, you can help keep your teeth white by brushing after every meal and snack with a soft-bristled toothbrush and a slightly abrasive toothpaste. Remember, some types of toothpaste can scratch and damage dental restorations. We offer Remin Pro® at our office, a gentle water-based toothpaste that neutralizes harmful acids, restores lost mineral content, and gently whitens the teeth without abrasives. We would be happy to discuss this option with you during your teeth whitening consultation. Proper dental hygiene can go a long way in keeping your teeth stain-free. Good teeth cleaning habits will fight the presence of cavity causing bacteria and the food debris that leads to yellowing. Part of a solid oral hygiene routine is twice-yearly visits to our NYC office for professional cleanings and examinations. During these visits, we will help you maintain your tooth whitening results by removing surface stains and gently polishing your teeth. If it has been more than six months since your last cleaning, call us today to schedule your next appointment. Am I a Good Tooth Whitening Candidate? These services are often used in conjunction with tooth whitening for a complete smile makeover. During this more involved cosmetic service, all aesthetic and functional problems impacting your smile will be addressed. The end result is a healthy, strong, and attractive smile that you will feel proud to show the world. During your initial consultation, we will listen carefully to your concerns, assess your teeth and gums, and help you determine which options will best protect and perfect your smile. Talk to Us About Your Financing Options! CareCredit is a healthcare financing company that offers a range of payment choices. Among these are 0% APR plans and fixed-monthly payments options, allowing the patient to choose the terms most suitable for his or her needs. You can apply for CareCredit at the link above or we can provide you with information about this and other financing options during your teeth whitening consultation. If you are searching for an experienced New York City teeth whitening professional, please call NYC Smile Design at 212-452-3344. 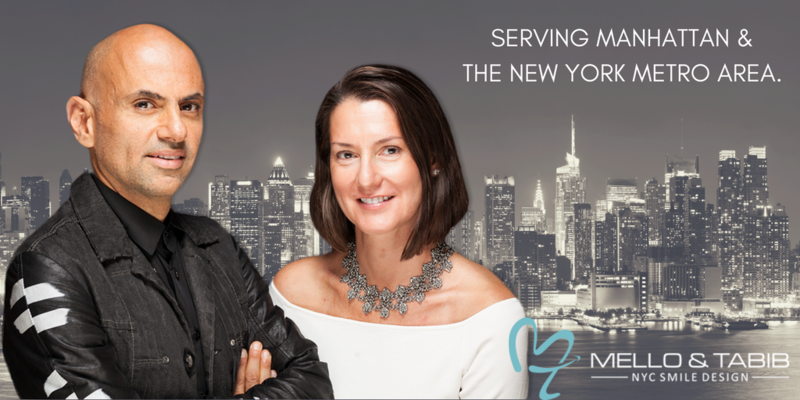 Our caring and skilled cosmetic dentists serve Manhattan and the entire New York Metropolitan area.